Sharp Lines Old Times: I want it - I buy it - I regret it. I want it - I buy it - I regret it. I collect Danish stoneware and have been doing so for roughly half of my life. It has slowly turned into my biggest obsession by far and is now at the point where I gladly drive across country to visit shops and large markets; always hoping to return with something beautiful to place in my own modest collection although that unfortunately rarely happens. I'm very picky, you see. Luckily Denmark isn't that large. Before I collected stoneware I actually collected colorful Danish art glass. Especially pieces from the pop'ish Palet and Carnaby series designed by mainly Per Lütken and produced at Holmegaard in the 1950's-1960's. However I slowly started to long for something with more texture, more depth and more weight. Also something a bit more masculine, I see now. And with a stronger presence of the earth we all walk on and live by. That something turned out to be stoneware. So in my late teens I sold my art glass collection and started collecting Swedish stoneware by the likes of Gunnar Nylund and Carl-Harry Stålhane from Rörstrand. Of course I also quickly learned about other ceramic masters like Stig Lindberg and Berndt Friberg from Gustavsberg but they were already then too expensive for my taste. This transaction from one world to another was easily made due to the bright colors, elegant shapes and overall joyful nature of Swedish stoneware. It simply seems less complicated, more straightforward and thus easier to comprehend for a beginner like me as oppose to the more meaty Danish stoneware which I thought of as being too sturdy in shape and too dull in color at the time. That would later change completely. I recently felt a strange urge to start collecting Swedish stoneware again, which I haven't been doing for years. I was especially attracted to specific pieces designed by Gunnar Nylund around the 1940's which are very simple, almost archetypical in shape and has bright, often monochrome colors. They're not always easy to find but can still be bought at reasonable prices, maybe because of their understated simplicity and slightly primitive shapes. This is why I personally like them however the present market for Swedish stoneware highly favors the far more bold and sculptural pieces from the 1950's-1960's. I looked around at some Swedish webshops and finally decided to buy this beautiful 23 centimeter high vase designed by Gunnar Nylund. It's stunning, right? However upon its arrival I changed my mind and suddenly collecting Swedish stoneware again seemed like a bad idea. Maybe it all happened in the first place because I hadn't bought any Danish stoneware for a while and was getting increasingly frustrated. As a avid collector you have this continues urge to buy. It's almost like a fever occasionally clouding your judgment. One's urge can be fuelled by many different reasons and they're often of a more personal nature. My urge is largely stimulated by the fact that the pieces I want and spent a lot of time searching for are very hard to come by. They're out there but I don't know where or when they'll suddenly surface. While I continuously try to cover as much ground as possible, both on the Internet and out in the field, all I can really do is wait. And even with all preparements in mind a little something called luck - with it's unpredicted and completely uncooperative nature - often plays a prominent role. You simply have to be at the right place at the right time whether its online or real life treasure hunting. If I don't find these pieces - and be the first to buy them! - they might be lost to another collector. And that scares me. Not that I'm the jealous type. I've just been around collectors enough to know that they very seldom let go of their prized possessions and often won't get even the slightest affected by whatever price you might offer after 15 minutes of complimenting smooth talk. And from them I am no different. If it wasn't for my pickiness, the rarity of the pieces I desire and their generally high price level that often makes my economy fall short, I could easily be labeled as a hoarder. However a really wonderful aspect about collecting things of such obvious quality is that you can fairly easy sell them again and regain your money or even make a little profit. The vase was quickly sold at a good price and is now resting among similar pieces at gallery FreeForms in New York. 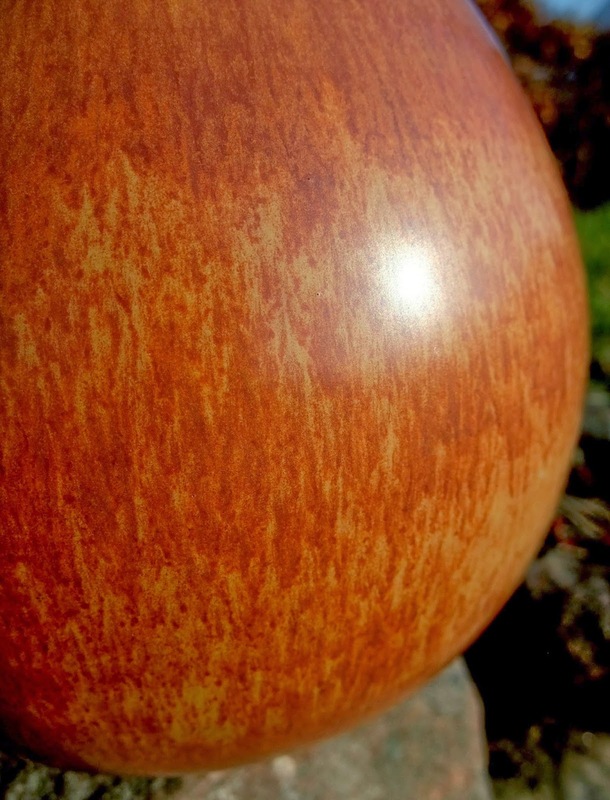 A few more snapshots of this orange colored beauty and its wonderful haresfur-like glaze. at the bottom with a thick rim and clear, simple markings. Later pieces can be a bit more rough in their execution. 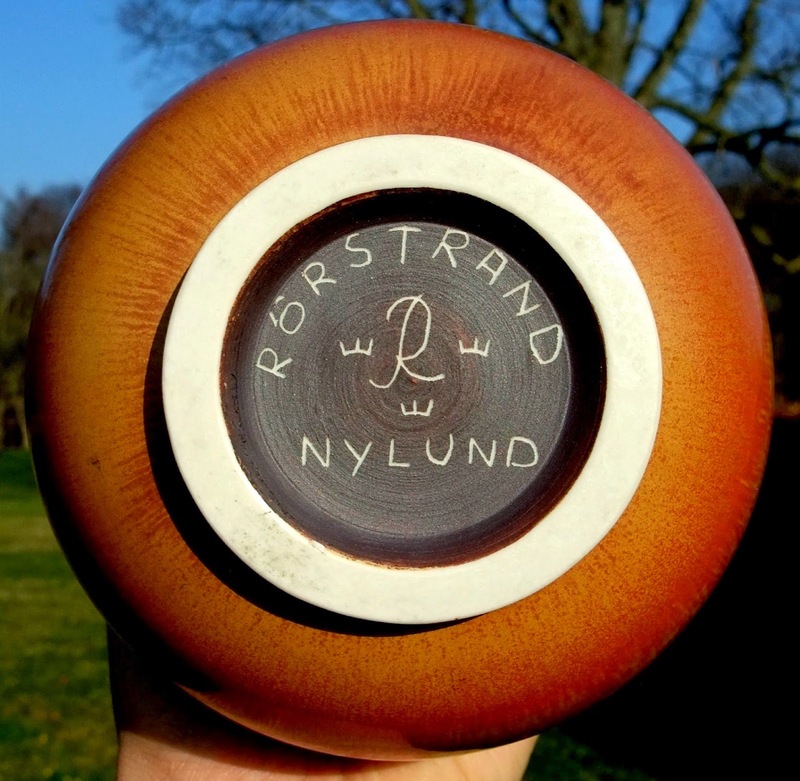 Dating a stoneware piece from Rörstrand is not easy as the markings on the bottom are often nothing more than Rörstrand's logo, the artist's initials and a model code (unless the piece is unique). This is unlike the works of fx Berndt Friberg of Gustavsberg or Nathalie Krebs from Saxbo who both used incised codes to indicate the production year. 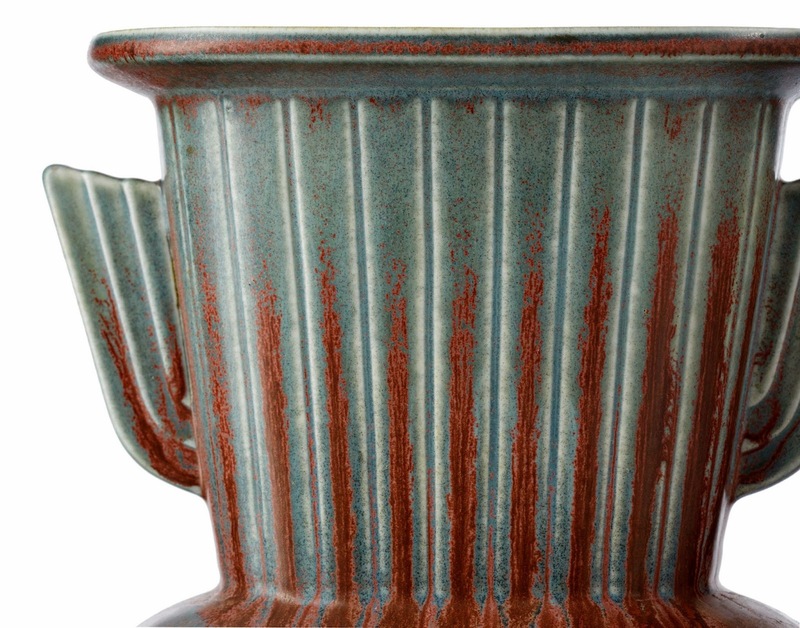 However this particular Nylund vase is from 1940's as the glaze itself is too modern to be from the 1930's. Furthermore the word 'Sweden' was added to the markings in 1951, probably due to increased export, and Nylund's surname was replaced by his initials GN. 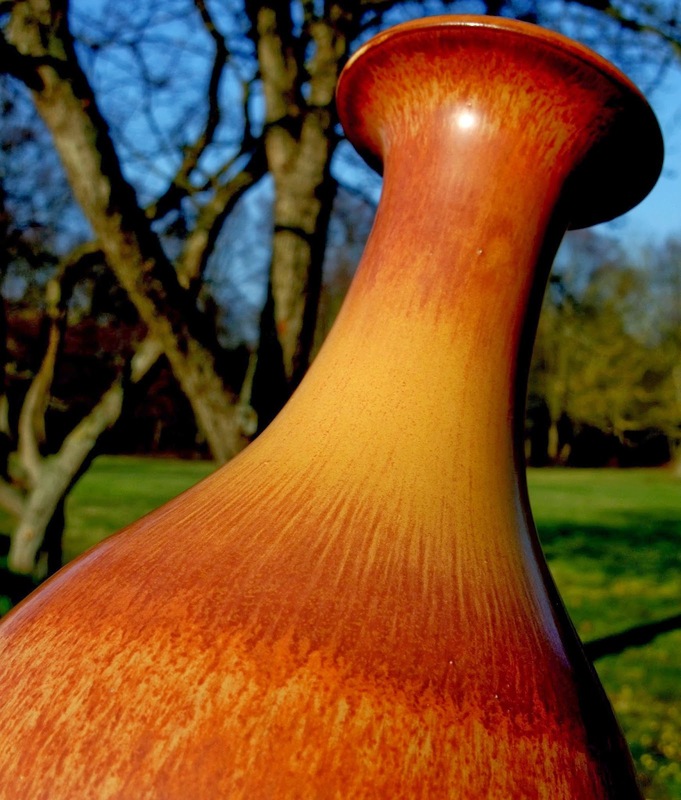 A year ago I had the pleasure of selling this fantastic Nylund vase from the 40's era. 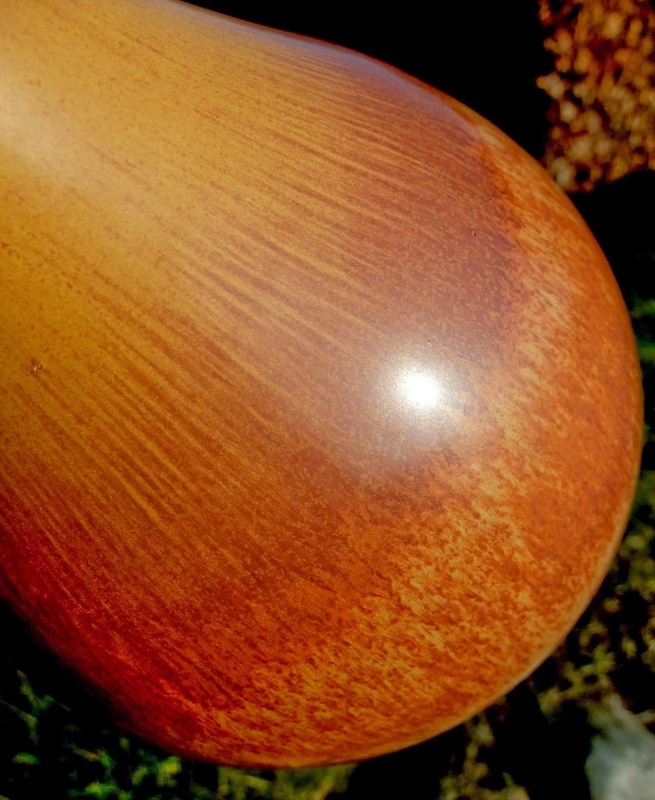 A close-up of the beautiful glaze covering the bolbous yet elegant shape. 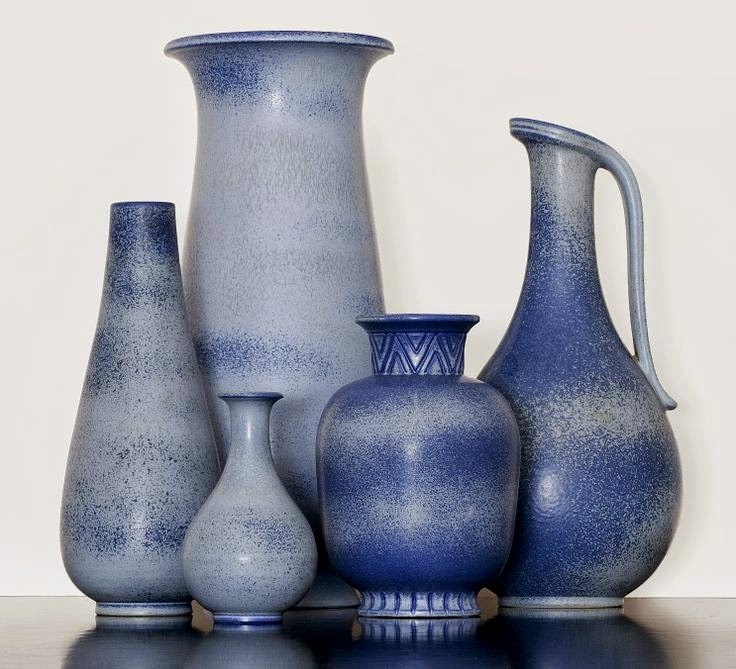 These are all Nylund designs from the 1940's covered in a gorgeous blue glaze with numerous white spots. 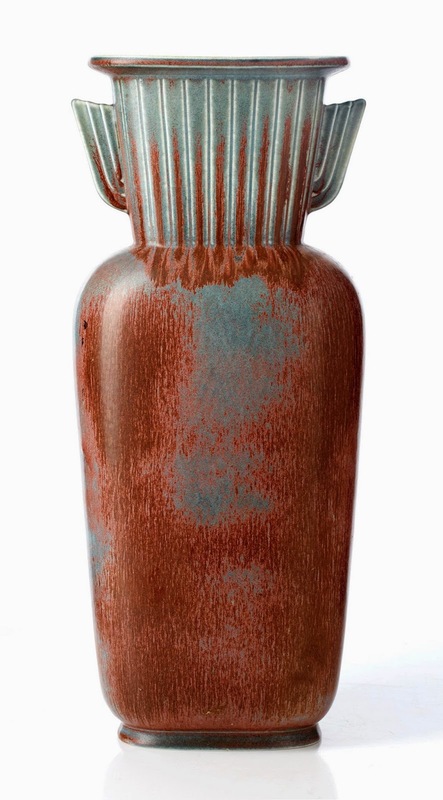 A very large Nylund vase with stylized Art Deco elements and a stunning haresfur glaze.